I was recently asked to write a bio about myself. This was harder than I expected. You see, writers don’t want to write about themselves, we’d much rather write about other people. Just check out this post about my friend Audrey and her opinions about my beautiful purple purse. And stay tuned for the next few weeks because I’m in the midst of putting one together about a little incident she had at the ski lodge a few weeks ago. Whenever a friend or my sister or Joe share an amusing or embarrassing story about themselves, they say do not put this in your blog. Unfortunately, all I hear is definitely write a post about this it’s so funny you’ll get a ton of hits and you’ll be famous because your husband bought you a butter dish shaped like a Buddha. Anyway, back to the bio. I asked my publisher what he thought I should write and to give me some examples of an author’s biography. I would mention his name here to give him some free publicity, but he’s asked me never to mention him in connection to anything I’ve written, said, or published ever again. It seems he’s regretting his decision to work with me. Next I asked my publicist what she thought I should write. (Note: nothing makes a person sound more important than the phrase my publicist. I’m going to start using it whenever I can. “Miss, would you like sparkling or tap water?” Well, I don’t know. Let me check with my publicist.) And just to give you an insider’s glimpse of the glamorous life I lead, right now I’m sitting at my computer working and I’m wearing a black velour bathrobe that I bought from Kohls when my third son was born and have worn every single day since. He’s seven. And it’s two in the afternoon. Both the publisher and publicist had the same advice; write creatively so people can hear my voice and be sure to include all the blah-blah-blah stuff about education and work experience. Oh, and use the third person even though I’m talking about myself. Weird, right? Carrie Cariello grew up in a teeny-tiny town in rural New York, a town called Wingdale. Wingdale was so small it had one stop light. Back then she was Carrie Watterson, and she was always the tallest girl in her class. After high school, Carrie went on to get a Bachelors of Science in Political Administration from the State University of New York and a Masters in Public Administration from Rockefeller College. During this time, she met a dark-haired guy named Joe who wanted to become a dentist. On Easter Sunday in 1997, in her small apartment above a hair salon, he gave her small sapphire ring and they laughed and cried and planned a wedding. Together they moved to Buffalo, New York where he went to dental school and Carrie began a career in marketing. For ten years she worked for an extraordinary construction company called Lehigh Construction Group Inc. and she got her MBA from Canisius College. She figured she might as well do something in the evenings while Joe was working in a dental lab making fake teeth. While they were in Buffalo they had a son, Joey. About a year later, they had another son, Jack. And from the time he was a small baby wearing dark blue footie pajamas with snowflakes on them, Jack was different. He did not talk or babble or coo. He did not point. He did not have things like joint attention or gross motor skills or eye contact. What he did have, Joe and Carrie eventually learned, was autism. Some days and weeks and months were very hard with their son Jack. Some nights he barely slept and some days he barely smiled. 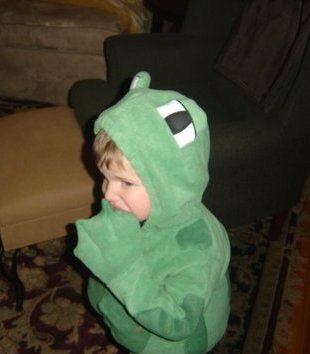 Sometimes Carrie thought very mean, un-mom like things in her tired mind, things like why can’t you be normal when he wouldn’t wear his Halloween frog costume and everyone is looking at us you are embarrassing me when he threw loud ugly tantrums in the library. Some days she wished he was not so different. They went on to have another boy and they named him Charlie. After Charlie was born in 2005 they moved to Bedford, New Hampshire, where they live today. Carrie did not dream of becoming a writer as a little girl in Wingdale, New York. She did not have visions of tap-tap-tapping her life story on a laptop for people to read on Facebook or in a blog or a book. But over time, she learned she could best make sense of her long, frustrating days with Jack and his autism if she wrote about them. Over time, writing has helped her separate the boy from his diagnosis and discover that she fiercely loves them both. It has helped her make peace with her beautiful son. And like a prism with countless different angles and light and rainbows, sometimes she sees her own reflection in her writing. Sometimes she understands herself better. There are days when she’s writing and she thinks this is a giant piece of crap why would anyone ever read this I am wasting my time. But then she makes herself move forward to post, to publish, to reveal. And people seem to like it. People are following her. Because like that prism, people see their own reflections in her writing, they see tiny colorful bits of themselves and their families and their autistic children in her essays. She gets her best ideas when she’s driving her bright red minivan. Her kids call it the Red Hot Chili Pepper. She and the dark-haired guy from college have been married for nearly fifteen years, and together they have four boys and one rosy daughter. Some days are long and difficult and exhausting while others are filled with color and music and chocolate-covered doughnuts. They are filled with laughter. But no matter what kind of day it’s been, whether one of tantrums and tears or lightness and bliss, there is always something to write about. Just ask my dear friend Audrey. Wonderful, as always. I never get tired of reading your stories, my only regret is that they end. I might have to start my own blog about how to take down the blog of Carrie Carriello. Well, we will always have flax seeds…. hahahaha…..You have WAY MORE on me than I could ever have on you! Thanks for being such a good sport! Oh, and I have no idea what you mean by flax seeds. Weird. Thanks Carrie, another glimpse of you in writing. You are amazing. Love the stories – our pasts always are helpful to others when we are ready to share & talk about it with others . You, my dear , have a gift of expressing your feelings on paper- it’s especially great to see that ” other ” side of Joe that only a few of us know – you’re awesome!! Thanks for sharing the kids !! This is Michael, the publisher, and just for the record I am NOT regretting my decision to work with Carrie. Not at all. I’ve read her book twelve times (that’s what publisher/editors do) and it still makes me laugh and cry–sometimes simultaneously.